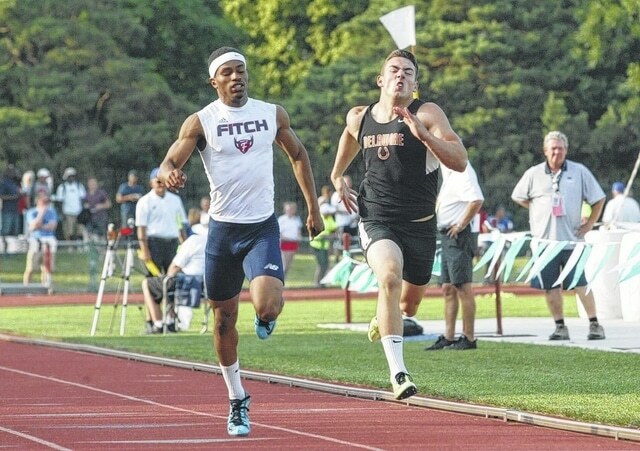 Hayes’ Ethan Tucky, right, and Austintown-Fitch’s Joe Harrington race toward the finish line in a preliminary heat of the 200-meter dash during the Division I Track and Field State Championships Friday at OSU. Hayes’ Ethan Tucky and Liberty’s boys 4×200 relay team survived Friday’s preliminary heats, earning spots in today’s finals thanks to solid showings during the first day of the Division I Track and Field State Championships at Jesse Owens Memorial Stadium. Buckeye Valley’s Emily Hilt, the lone local D-II competitor, also made some noise, clearing 5-02 to reach the podium in the finals of the girls high jump. She finished eighth. Tucky, a junior, finished with the sixth-fastest preliminary time in the boys 200-meter dash, advancing with an effort of 21.98 seconds. He will be in lane seven for today’s final. Liberty’s boys 4×200 relay team (Michael Tweddle, Trevor Collins, Josh Pickens and Jacob Merrels) also finished with the sixth-fastest time among the 16 teams in action, crossing the finish line in 1:27.79. The quartet will be in lane seven for today’s final. Other area standouts slated to compete today include Liberty’s Mitchell Towne in the boys 800, Orange’s Hunter Moore in the boys 3,200, the Patriots’ Claire Wiles in the girls 1,600 and 3,200, where she’ll be joined by teammate Emma Bower, Liberty’s Sam Silber in the girls pole vault and Big Walnut’s Abe Myers in the boys discus. In other D-I action, Liberty sophomore Abigail Summers saw a solid season come to an end, tying for 11th place in the girls 200-meter dash preliminaries. She finished in 25.26 seconds. Liberty’s girls 4×800 relay team (Trinity Wiles, Claire Linn, Bower and Claire Wiles) also saw its postseason push come to a close, finishing 15th in the lone running final of the afternoon with an effort of 9:36.25.